A documentary based on the investigations of Alfredo Gamarra. He concluded that the magnificent stonework of Cusco, Peru, attributed to the Incas, was constructed in a completely different way than proposed normally. There are 3 different styles to be observed, corresponding to 3 different periods, the first 2 go back in time much further than Inca time'. This documentary is the visual evidence of Alfredo's claims. 1. Different calendars of the past, the Cosmogony of the 3 worlds is reflected in symbols all over the world. 2. Hanan Pacha, first world. This first construction style was considered sacred by the following two styles. 3. Uran Pacha, second style. Examples are the walls with the perfect fitting stones. 4. Ukun Pacha. Present period. In the vestiges of Cusco it were the Incas constructing over or around the other two earlier styles. It was all during our present period of time and orbit of 365 days, very recent. Only the walls with smaller and not perfect fitting stones, were made by the Incas, the 2 earlier styles are much older. Examples of these constructions. 5. 'Over' Construction, many examples of the 3 different styles above each other in always the same order. 6. Surrounded Rocks. Examples where the first style is surrounded with the walls of the second or third style, as a type of protection or respect. These rocks were definitely sacred! 7. Moldable Stones. Examples were the moulded aspect of the rock is obvious. These can be found in both first and second style. A simulation with clay and a comparison with modern package material. 9. Other Places in the World with same characteristics. The styles and phenomena mentioned above also exist in other places as are for example Egypt, Malta, Turkey, Felsberg, Jerusalem. 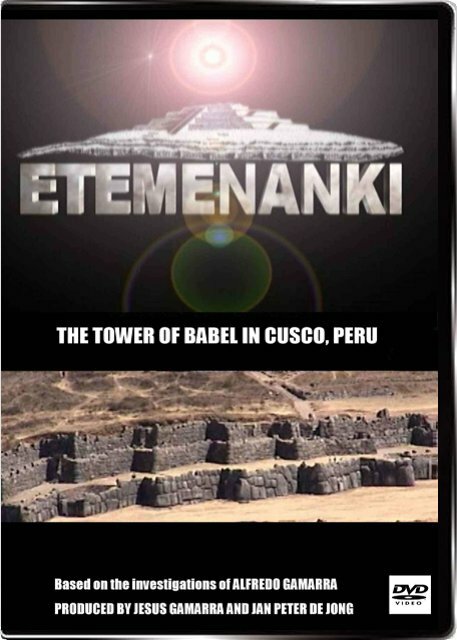 Etemenanki, The Tower of Babylon in Cusco, Peru? Is Cusco in Peru, known as the old Capital of the Incas, the Ancient City of “Babylon the Great”? And could the most cyclopean structure on earth, just above and to the North of the City and known as Sacsayhauman, be the Legendary “Tower of Babel”? 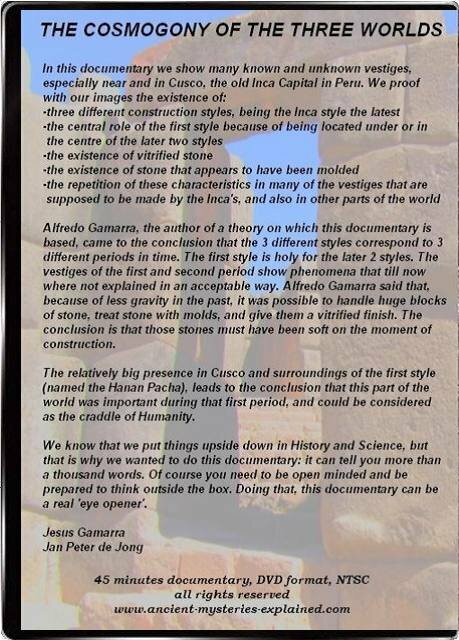 These questions are not that strange anymore once one understands that the most advanced and biggest stonework found in and near Cusco, has not been the work of the Incas but from a much earlier culture, a culture that was able to build the megalithic vestiges around Cusco and around the world. 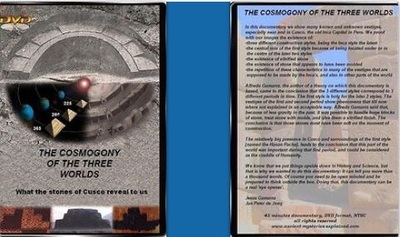 There are striking similarities to be recognized between those vestiges, explained in detail in our other documentary “The Cosmogony of The Three Worlds”. It isn't that strange anymore either if one leaves behind the old paradigm of the American continent being “The New World”. 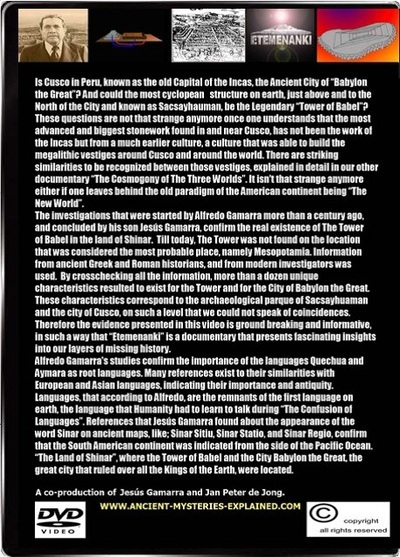 The investigations that were started by Alfredo Gamarra more than a century ago, and concluded by his son Jesús Gamarra, confirm the real existence of The Tower of Babel in the land of Shinar. Till today, the Tower was not found on the location that was considered the most probable place, namely Mesopotamia. Information from ancient Greek and Roman historians, and from modern investigators was used. By crosschecking all the information, more than a dozen unique characteristics resulted to exist for the Tower and for the City of Babylon the Great. These characteristics correspond to the archaeological parque of Sacsayhuaman and the city of Cusco, on such a level that we could not speak of coincidences. Therefore the evidence presented in this video is ground breaking and informative, in such a way that “Etemenanki” is a documentary that presents fascinating insights into our layers of missing history. Alfredo Gamarra's studies confirm the importance of the languages Quechua and Aymara as root languages. Many references exist to their similarities with European and Asian languages, indicating their importance and antiquity. Languages, that according to Alfredo, are the remnants of the first language on earth, the language that Humanity had to learn to talk during “The Confusion of Languages”. References that Jesús Gamarra found about the appearance of the word Sinar on ancient maps, like; Sinar Sitiu, Sinar Statio, and Sinar Regio, confirm that the South American continent was indicated from the side of the Pacific Ocean. “The Land of Shinar”, where the Tower of Babel and the City Babylon the Great, the great city that ruled over all the Kings of the Earth, were located. 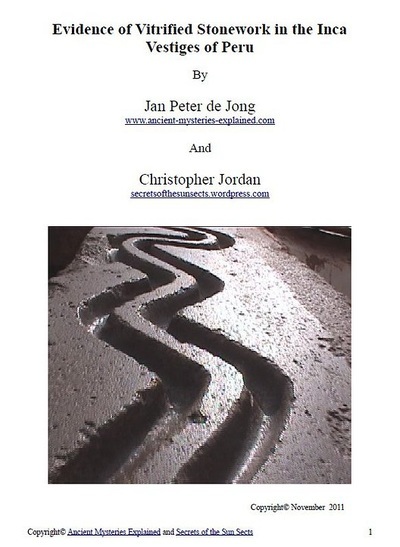 Produced by Jesús Gamarra and Jan Peter de Jong. This paper deals with the questions surrounding vitrified stones in Peru. Whilst many of these stones have been tested in the rest of the world there seems to be little if any analysis on the Incan vestiges. The range of stones and locations is quite phenomenal. 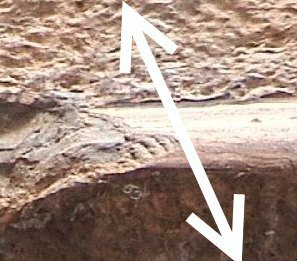 The simple methods to identify these types of artifacts are outlined. There are several fine examples on view in this short video: http://www.youtube.com/watch?v=ae_8ri2fiwI, and on the DVD that will be available shortly. 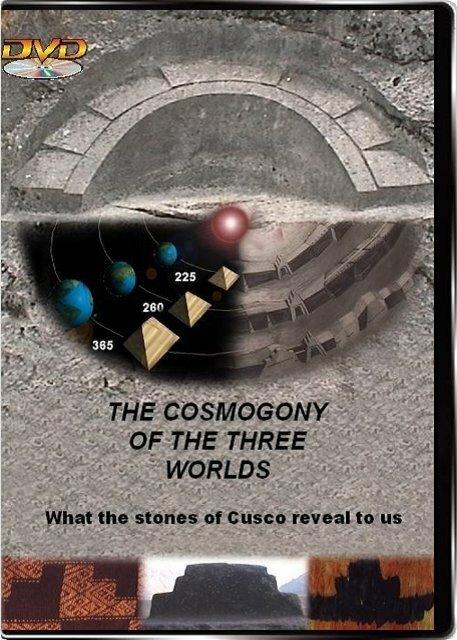 The DVD ''The Cosmogony of the 3 Worlds'' shows an overview of this phenomenon in the chapter on Vitrified Stones. A small sample was taken from a cave for further analysis. It was sourced in a curious cave with many man made altars, platforms and cutouts. The type of vestige that is according to Alfredo Gamarra the "Hanan Pacha" style. Some of these pieces of stonework are mysterious enough in their own right. Through detailed spectral analysis of the sample, it is shown that the ancient Peruvians could apply a kind of ceramic finishes onto limestone. This is an intriguing result considering the problems associated with heating massive blocks and the chances of fracturing the limestone body. 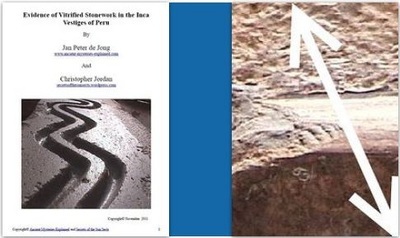 Whilst the layer compares well to other South American ceramics, the method of production cannot have been through conventional kiln methods since it is a cave. The questions the results raise over the technology used to achieve this are briefly discussed. Whilst some options such as polishing or natural phenomena are excluded based on the fact the sample is a ceramic glaze. It is not clear which if any of the others are able to deliver the surface finish in a cave. The method of production ultimately remains a mystery.